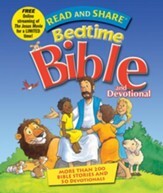 Send your little ones off to a peaceful sleep with My Bedtime Story Bible. 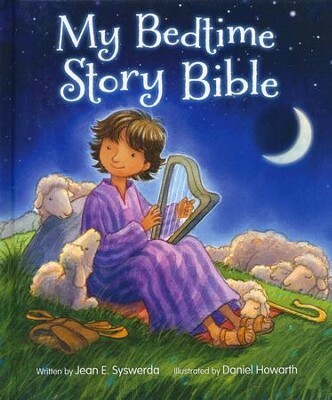 Written in a quiet and soothing tone, this Bible storybook features 28 Bible stories that focus on the day of a favorite Bible character and ends with him or her drifting off to sleep, thanking God for his faithfulness and love. A wonderful new tradition to your child's bedtime routine. 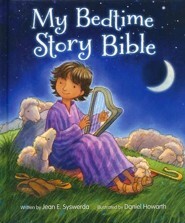 My Bedtime Story Bible focuses not only on biblical characters and stories, but also on the quiet times of those characters before sleep. Parents will enjoy reading My Bedtime Bible Story to their children just before bed. And children will enjoy hearing stories about bible characters and the truths they can learn from themall in a manner that promotes quiet, settled moments rather than noisy, busy times. Jean E. Syswerda is a former editor and associate publisher for Zondervan Bibles. She helped produce such bestselling Bibles as the NIV Womens Devotional Bible. General editor of the Women of Faith Study Bible and A Mom's Ordinary Day Bible Study Series, she is the author of the Women's Devotional Guide to the Bible and coauthor of the bestselling Read With Me Bible. Jean and her husband, John, have three children and eight grandchildren. They live in Allendale, Michigan. I'm the author/artist and I want to review My Bedtime Story Bible.